Cross stitches aren’t just for old ladies ! 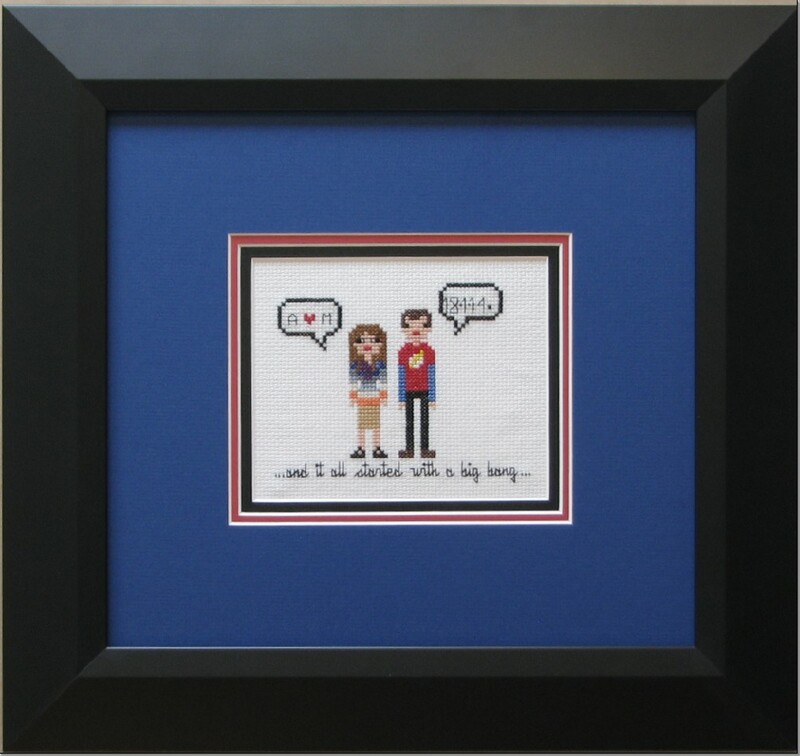 Our client, an extremely avid cross stitch artist, brought this fun piece in for framing. She got the pattern from Wee Little Stitches, a shop that sells contemporary cross stitch patterns online. At the heart of their business is Pixel People. 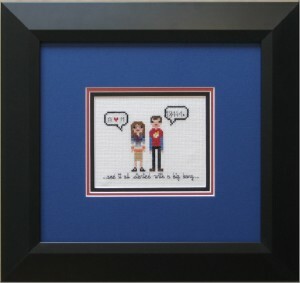 One Pixel People pattern has the two awesome characters from the The Big Bang Theory : Sheldon & Amy. Our client’s sister and new husband love the show and identify somewhat with those two characters. A little bit of reworking of the pattern (she put in their wedding date and initials) and she had a quirky and meaningful gift that the couple will cherish throughout their married lives. Why not try your hand at a little something different? The art of cross stitch is a relaxing, fun & creative hobby. Following a pattern, from easy to very intricate, you get to create beautiful needleart. You can either steal some old patterns from your grandma or you can get a pattern from this century from people like Jacqueline from Wee Little Stitches (by the way, she’s from Ste. Catherines, Ontario…yeah Canada! go!) who are developing patterns for the new generation of stitchers. And when you are finished, what are you going to do with it? Stick it in a drawer? In a box? Throw it away? NO! You are going to SHOW IT OFF! Think: How many hours of your precious time and skills (and money, don’t forget your supplies) did you invest in your piece? Please don’t staple it, glue it, tape it down to cardboard and slap it in a doesn’t-quite-fit-but-it-was-cheap-ready-made-frame. It deserves a whole lot better, and so do you. We at Walkerworks love seeing our clients frame their own creations so much that we actually give 15% off custom framing, to all “artists” framing their own stuff. So celebrate your creations and invest in a professional framing job.